Paradise Club on Soho Hill, Handsworth. A club has lost its licence after its bosses claimed they were unaware a shooting had taken place - because they were playing dominoes. 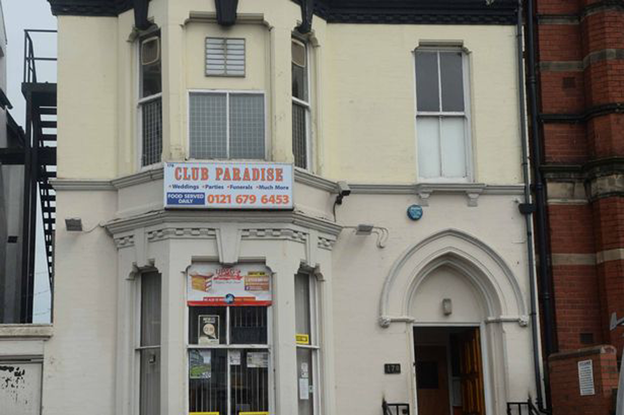 Licencing chiefs revoked the licence of Handsworth's Club Paradise after police said management had "zero control" on how the premises was run after they discovered a shooting had taken place outside on March 14. The incident was not reported to police, who only found out about it after a bullet casing was found by a member of the public. The venue on Soho Hill had its licence suspended in 2012 after a man was shot in the leg in a gang-related incident. Detectives only found out about that shooting after they were called by medics who were treating the victim at hospital. Following the latest shooting police seized CCTV which showed drinkers fighting inside the Paradise Club with one man being hit over the head with a bottle. Customers then spilled out onto the street where a shooting took place. It did not result in any injuries. The footage also showed customers walking into the club through a knife arch which repeatedly flashed – but did not lead to any searches. Officers said it also showed known gang members present. Designated Premises Supervisor, Rupert Phillips, denied any knowledge of the shooting adding that he did not think it had even taken place. But he also told the licencing committee that he planned to stop the events that brought trouble on Friday and Saturday nights. He added: “I plan to stop the nights and to change security. It was because of the incompetence of the security and we are talking to a different company now. “I am there all of the time. Sometimes there are problems, but they all know each other and sort it out between themselves. Chief Superintendent Emma Barnett, who applied for the review, said in a written submission: “Management of the premises indicated that they were there over the weekend but had been playing dominoes and had not been aware of any incident. “They did indicate that door staff had been rushed during the evening on March 14 and into the morning of March 15. “On viewing the CCTV officers witnessed a serious disorder inside the premises, which involved a male hitting another male over the head with a bottle before all groups run out of the premises. “The CCTV also showed that there were people inside the premises who are known to West Midlands Police to be members of local criminal gangs. Police told the committee that they had held eight meetings with the venue since January 2014 in a bid to support the club which is open until 6.30am at weekends. Speaking at the meeting Licensing officer, Pc Adam Mroczkowski, that the club had been on an action plan after an earlier fight in November 2014, which was again caught on CCTV, but not reported to police. He said: “The premises continues to operate in a dangerous manner with almost zero control on how the premises runs. “In our last meeting before this incident the management disclosed that they had lost control of the premises. On revoking the licence Chris Neville, Head of Licensing, said: “This review highlighted a concerning number of issues relating to poor security and effective management of Club Paradise, including the fact no-one thought it prudent to contact the police when a fight occurred inside the premises.